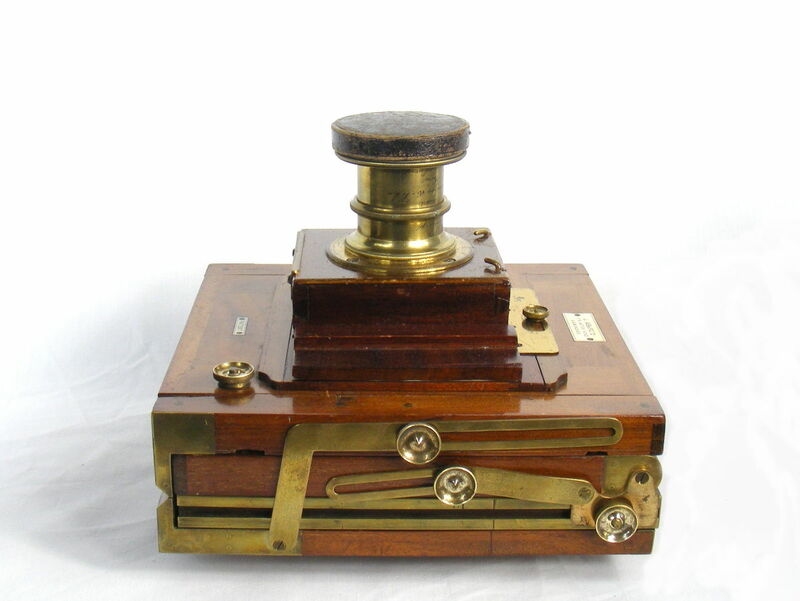 The New Patent camera by James Ashford (179 Aston Road, Birmingham) is a high quality camera, made to patent 541 (1887), which relates to a means of improving the folding of the camera. The bellows detach from the lens standard so that they can be pushed back into the rear standard. The rear standard then folds down onto the base. The front then tips back to fold down over the other components. An advantage of this design is that the lens does not have to be removed. The design also offers protection to the ground glass screen. 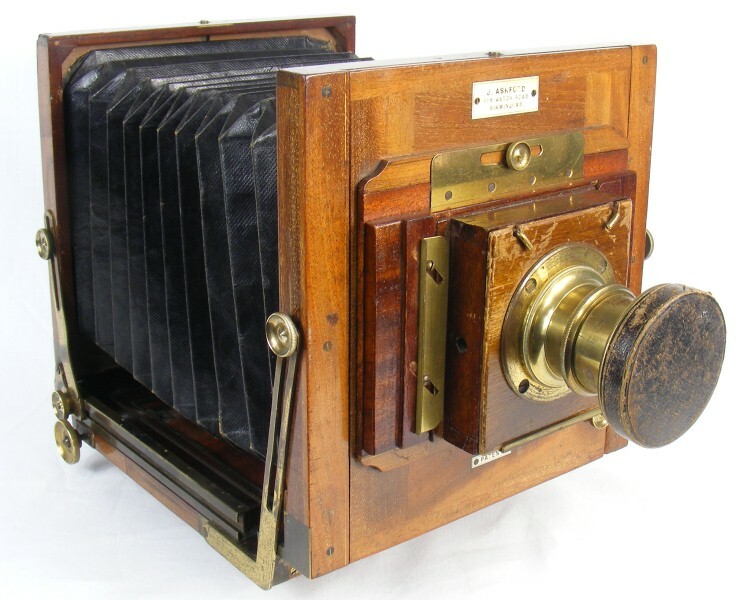 According to Channing & Dunn , this is also one of the fist cameras to employ bellows with chamfered edges rather than the square cornered bellows that were far more usual on cameras of this era. 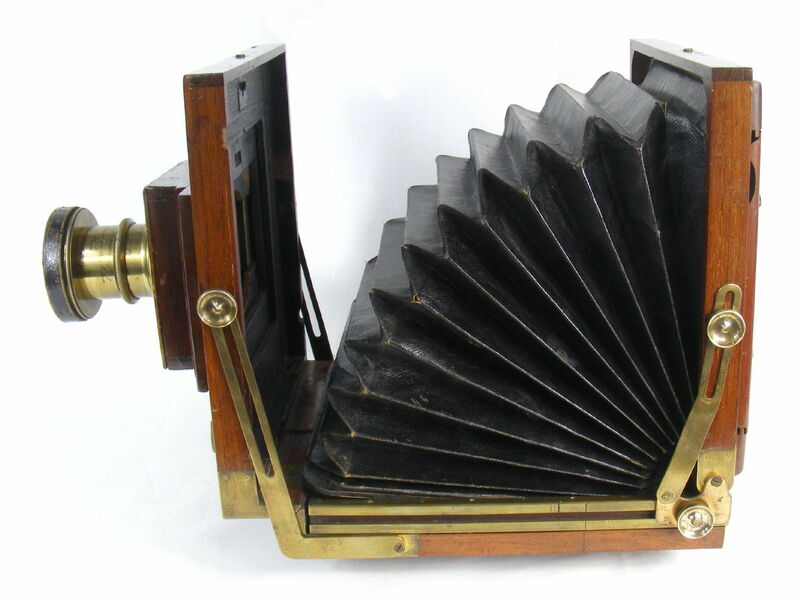 The camera has double extension bellows, and incorporates fittings for a septum. The rear standard is moved by rack and pinion (straight cut). 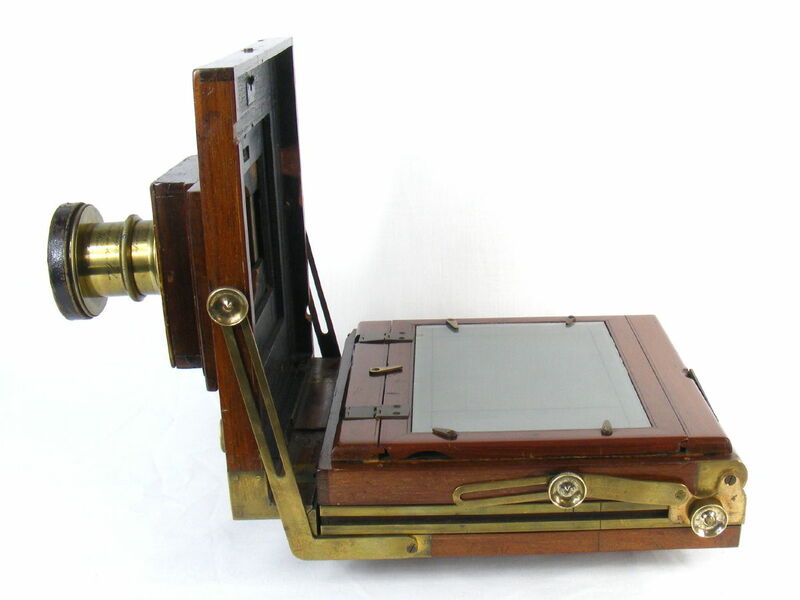 The small brass button on the top face of the front standard releases the bellows assembly (further details and photos below), while a similar button on the top edge of the rear standard releases the frame that holds screen and DDS to allow it to be rotated to suit use in landscape or portrait format. Only dedicated dark slides can be used; one is with this camera. ClicPic Photos copyright © 2016 David Purcell. Do not use without permission. I have no idea if the Voigtlander lens is original to the camera; very likely not. I am certain that the box on which the lens is mounted is not original. 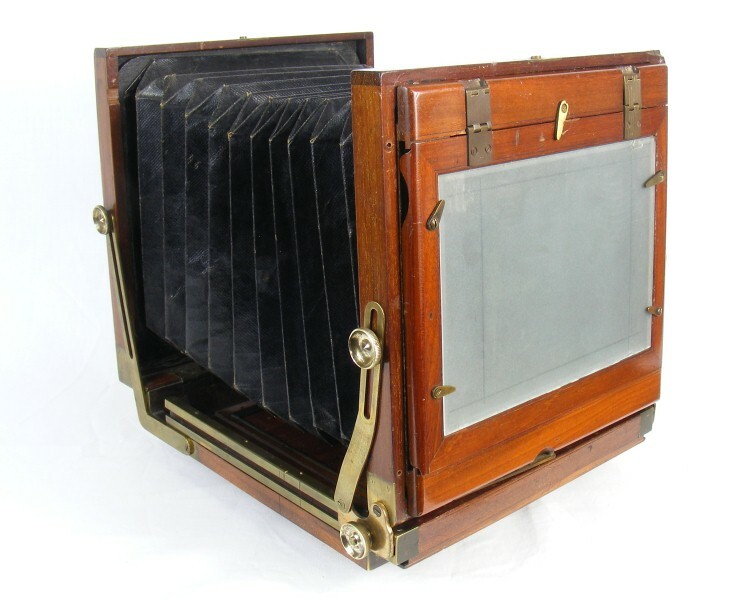 When the front panel is removed it reveals a Zeiss Ikon compound shutter, without lens, used as a behind the lens shutter. There is a hole in the side of the box to allow a cable release to be used. The following set of pictures illustrate the stages in collapsing the camera. Step 1: The bellows have to be released from the inner face of the lens standard by pressing on the release button on the top edge. The bellows are mounted onto a stiff board that fits snugly inside the inside of the lens standard. 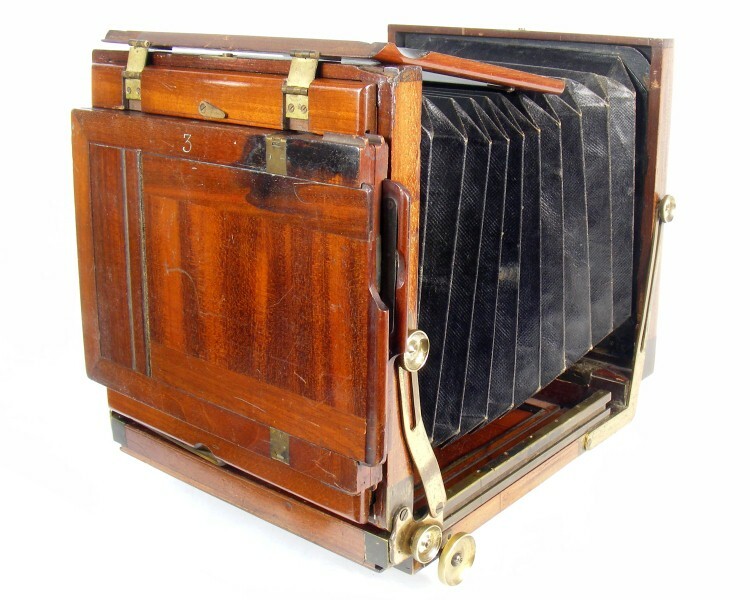 Step 2: The bellows can be allowed to relax so that the front panel rests inside the base of the camera. Step 3: The back of the camera can now be folded down onto the base, containing the bellows between the two components. Step 4: The front lens standard then folds backwards over the top of the back, by virtue of the hinge at the lower edge and the crooked support arms. Note that the glass screen is now in the centre layer and is therefore entirely protected. 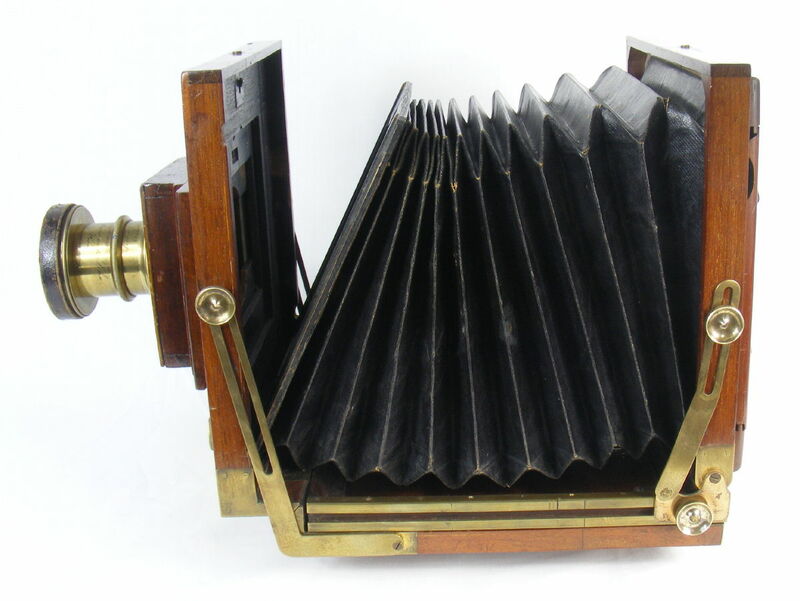 A second advantage in comparison to many other designs of the period, is that the lens and shutter do not have to be removed. This camera was gifted to me from the collection of the late Eric Evans (www.woodandbrass.co.uk) after his death in October 2016. The very first time I met Eric, and after my initial "wow" reaction to being shown the attic room that contained much of his magnificent collection of wood and brass cameras, we were discussing the merits of various camera designs. I commented that I had a particular fascination with the many different designs used in the way the cameras folded, and positioned the different components. At that, Eric passed me the folded Ashford and commanded that I try and erect it into its open position. Heart in mouth at the prospect of doing damage (he waved that away), I then set about doing so. 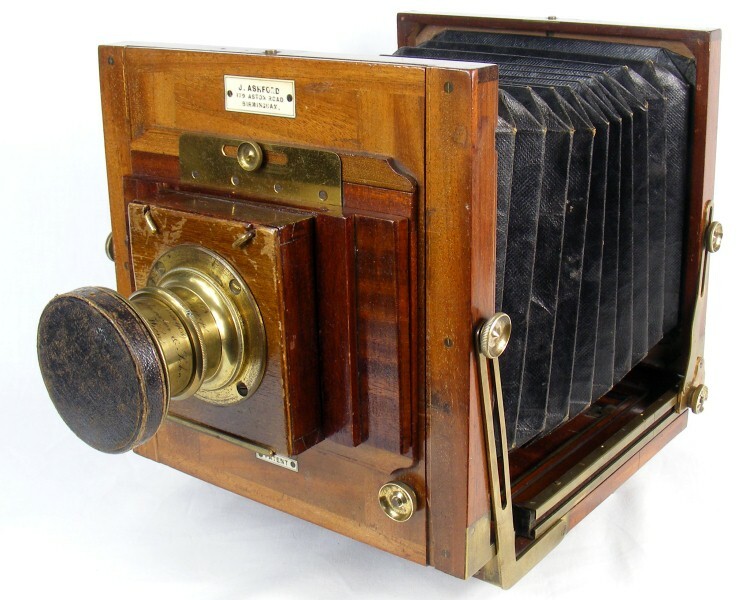 I was fascinated by the design of this camera, but thankfully was saved embarrassment by succeeding in unfolding it!